Toast the tomatoes and peel them. 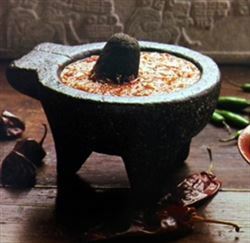 Put the chilis, garlic and the tomatoes in a molcajete and grind everything up. (A molcajete is a rough-surfaced mortar - usually made of volcanic rock - for grinding up spices and vegetables.) Add salt and diced onion. This was my first time making homemade salsa, and it was very simple and delicious. After making this, I would never buy anything that is jarred. This salsa was very simple and very delicious!